Seven 1 3/4" capacity slots for letter or A4 size folders and documents. Impact-resistant plastic construction in a stylish design. Nonskid rubber feet protect surfaces from scratches and scuffs. 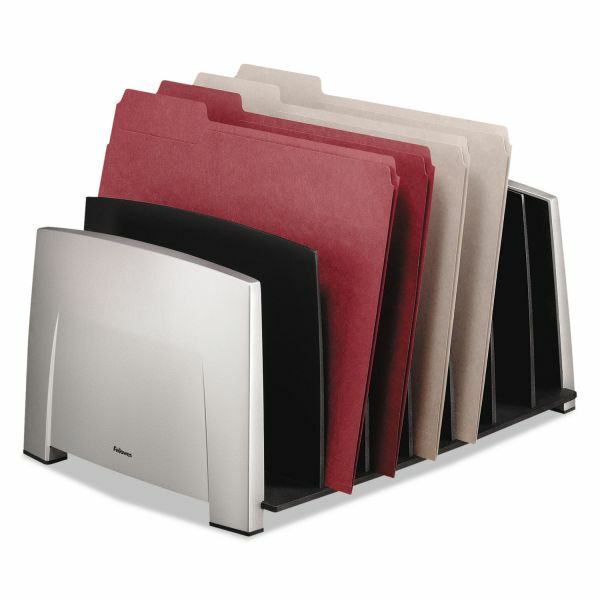 Stacks on Office Suites™ Letter Trays (sold separately). Fellowes File Sorter, 7 Comp, Plastic, 14 1/2 x 10 5/16 x 7 1/2, Black/Silver - Organize and prioritize your files with the Office Suites File Sorter. Convenient desktop filing solution offers seven 1-3/4 capacity sorter slots. 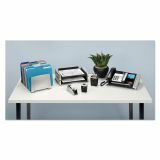 Desktop File Sorter matches the rest of Fellowes Office Suite Desk Accessories with smart styling in contemporary black and silver for the professional work space. 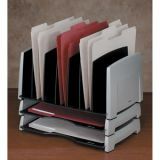 Designed to stack on Office Suites Letter Trays so you can customize your own organizational system. Nonskid rubber feet protect your worksurface from scratches or scuffs. Made of plastic."